German midfielder Mesut Ozil has reportedly decided to remain with Arsenal rather than pursue a temporary move elsewhere during the winter transfer window. The 30-year-old has been in-and-out of the starting lineup under Unai Emery during the current campaign and this has raised question marks regarding his future with the club. According to ESPN FC, the German remains unperturbed by the ongoing situation and he is prepared to decline the chance to secure a temporary challenge elsewhere. 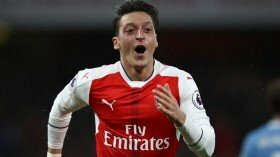 It is added that Ozil is confident of reclaiming a regular role under Emery with the hectic schedule for the Gunners during the backend of the ongoing campaign. The former Germany international has recently been sidelined with a knee problem which has witnessed his absence for the games against Liverpool and Fulham. His unavailability may continue for the FA Cup tie at Blackpool this weekend with Emery recently admitting that he is unsure regarding a possible return date for the midfielder.